• There are only two after-school rehearsals. Every other rehearsal is directly before a game. We will play the 4th quarter of the JV game, in-between games, and during the varsity game. Band members have the third quarter of the varsity game off. • If you cannot attend a performance, please notify Mr. Keller as far in advance as possible. Only members attending at least 6 of the 7 games will receive their patch/bar at the awards banquet. 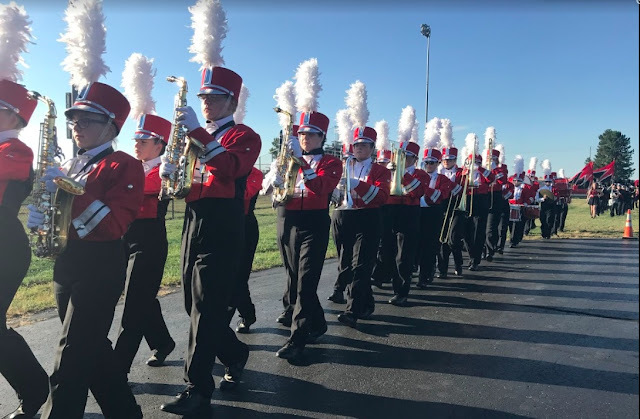 We will rehearse before each game, so you need to be in the band room and ready to play at the report time. • Please dress appropriately for each game. The preferred dress is your basketball band t-shirt. If it is in the wash, please wear school colors…red and white. Mr. Keller reserves the right to prevent you from performing if you are dressed inappropriately. • T-shirt information will be available soon. The cost will be $12. • You will be admitted free of charge to games at which we are playing. Please enter through the front door and sign in at the ticket table. The back door is only for set percussionists. • When on stage, do not play unless we are playing as a group. Do not play while the game is in progress. There are only certain times at which we are permitted to play. • Music folders will be distributed soon. They are on LOAN to you and are to be treated with care and respect. Please keep the music neat and in numerical order. • The sign-up sheet is on Mr. Keller’s office door. • Please be on time. Games are usually over around 9-9:15. Please arrange to have your ride to pick you up on time. If you need to use the phone, you must have Mr. Keller’s permission. • Individual practice may be required for you to get down the tunes we play. It is expected you play your best at all times. Believe me….people are listening to you! • If you have any questions, please contact Mr. Keller. Remember that you ARE the SIXTH MAN…and can make a difference. Let's cheer out team on to a VICTORY!